What if powerful nations like the US, Russia, China, Great Britain and France announced to the International Olympic Committee, “We reserve the right to give our athletes performance enhancing drugs and they will participate in the Olympic games anyway, no matter what you say,” adding soto voce, “Oh, and we’ll let Israel use them, too, but we just won’t talk about that.” Unthinkable, you may say? At the opening ceremony of the 2018 Winter Olympic Games now in progress in PyeongChang, South Korea, IOC President Thomas Bach, hinting at past doping scandals, admonished all the assembled athletes to play by the rules of Olympic sports. So how do the powerful nations, in particular the US, get away with playing by very different rules from others when it comes to one of the most life-threatening scourges of our time, namely nuclear weapons? The US, the only nation to ever use nuclear weapons, subjecting the people of Japan to unspeakable horrors, is quick to assume a holier-than-thou attitude when proclaiming who else is allowed and who is not allowed to develop, possess, and upgrade these killing machines. The world’s stockpile of nukes could destroy humanity many times over. The vast majority of countries have already renounced nuclear arms and voted last summer at the UN to ban nuclear weapons. The International Campaign to Abolish Nuclear Weapons gained worldwide recognition as recipient of the 2017 Nobel Peace Prize, yet the major powers refuse to commit to a pathway towards verifiable mutual disarmament. To this end the friendly gestures and beginnings of dialog between North and South Korean leaders on the occasion of the Olympics in PyeongChang should be welcomed with optimism. Mainstream US media, however, repeatedly and cynically dismiss this rapprochement as a ploy by the North to divide Seoul and Washington, when it is the two Koreas who should be natural allies and the US really has no business meddling in their affairs. And clearly popular sentiment is leaning towards reunification and peace. 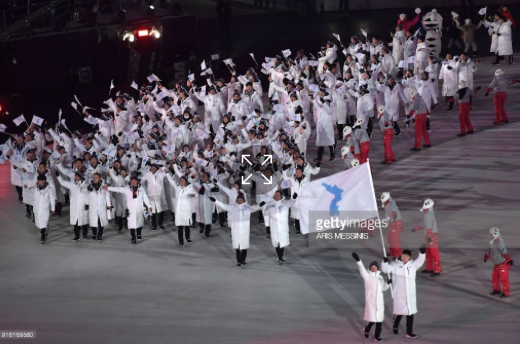 The most heartwarming moment of the Opening Ceremony was the entrance of the unified Korean Olympic team, led by two flag bearers, one from the South and one from the North jointly holding the unification flag: white background with skyblue image of the entire Korean peninsula. Both the athletes and throngs of North and South Koreans in the audience waved the same flag and cheered. Enthusiastic ovations continued as the united Korean women’s ice hockey team struggled valiantly against its vastly more experienced opponents. Though losing all three first round games (8-0, 8-0 and 4-1), the Koreans had the biggest fan support, and when they did manage to score one goal, the crowd went wild, erupting with a roar and waving thousands of white and blue unification flags. Television cameras showed more collective cheering as pairs figure skaters from both North and South Korea competed on the ice, while behind the scenes flashing social media photos of each other practicing together. 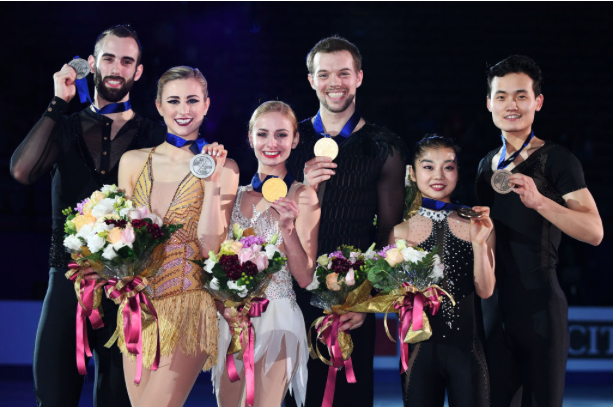 Preceding the Olympic spotlight, figure skating aficionados witnessed North Korean and US figure skaters joyfully sharing the medal podium at the International Skating Union’s Four Continents competition last month in Taipei. Sometimes it is regular people in unlikely places who need to show world leaders the way: ice hockey players or figure skaters here; families attending an international sports event there. People who have an innate sense of fairness and solidarity and are willing to follow sensible rules, as long as they are applied evenly. This article originally appeared on Transcend Media Service (TMS) on 19 Feb 2018. Anticopyright: Editorials and articles originated on TMS may be freely reprinted, disseminated, translated and used as background material, provided an acknowledgement and link to the source, TMS: Playing by the Rules? Nuclear Powers Could Learn from Olympic Athletes and Fans, is included. Thank you. To normal people this sensible suggestion does not sound impossible, but the sad point is the quite strong and wilful refusal of the USA and some of its “allies” to try to imagine a world without war and conflict. Instead of looking inside their own actions and decisions they cast blame to others, regardless of the facts. As in Syria, Iraq, Ukraine, all of Latin America, the influence of the USA unasked and never positive for the inhabitants, pretending to “help” instead of solving its own monumental problems in the Homeland.